We are currently developing a rear coil-over suspension to compliment our front suspension kit. This is our preliminary process of fitting everything thing up. Our R&D staff has informed me that we may be making some revisions to this initial design. I will be posting additional photos as the kit is further developed. That being said, here is what we have in mind. In keeping with the Total Control tradition of utilizing existing mounting points we used the front mounting location of the leaf springs as the pivot point for the trailing arms. This trailing arm is constructed from extremely thick walled tubing and uses the same type of rod ends we utilize in our front suspension components. 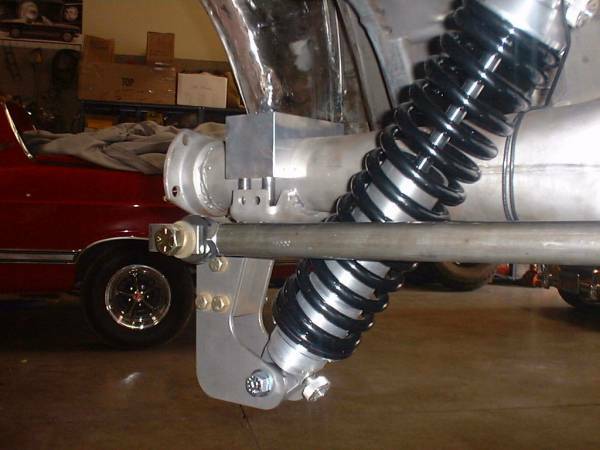 The rear of the trailing arms are mounted to the assembly bolted around the axel housing. There will be a small amount of welding necessary but no more than is required for our Subframe Connectors. As with our front suspension system ease of adjustability is a key feature. When this kit is finalized we'll be able to dial in the rear end to act just how we want. 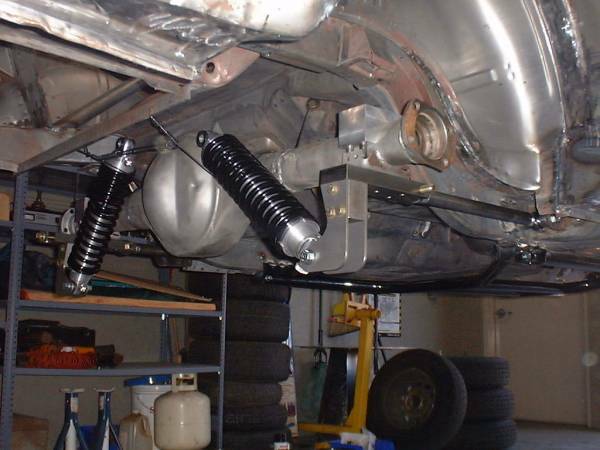 Look for adjustable compression, rebound, ride height, panhard bar and rear end pitch. I hear the car may be going to the body shop soon. Hopefully next month we'll have a new coat of paint.